» is the real state of ARI’s research. » measure” to get results. » Again, this is a risky theory, but very possible. … but it’s a damn good “theory”. In fact, it’s the truth. It’s NOT my intention to confuse anyone here, but FACT IS FACT. 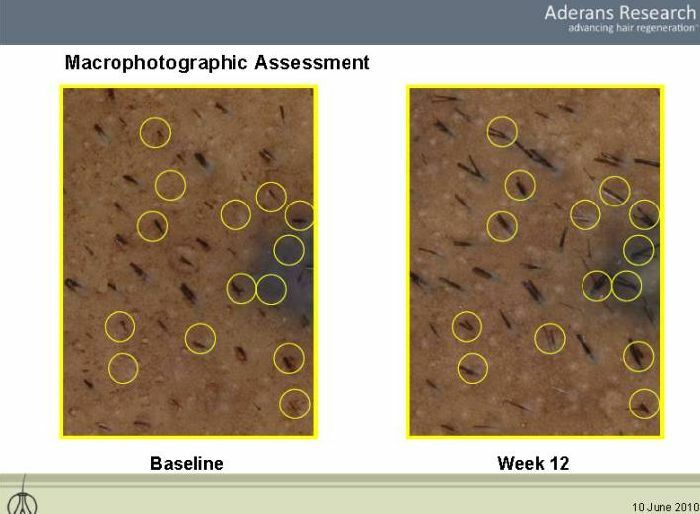 Aderans seems to not be working, or they wouldn’t have grown their Phase II study - they’re trying new techniques because their first one didn’t work well enough. Let’s assume, YOU are “Dr. Ken Washenik” – ok? Anyway, THESE few pics above show you just the reality – the reality WITHOUT any skin pre-stimulation with Minoxidil! » they mention using Minox as well. a channel opener (e.g., minoxidil). I don’t know why that is such a big deal to be honest. That’s because it isn’t such a big deal. formed follicles cycle, and moreover that the newly formed follicle cycle has a period very close, if not exactly matching, the cycle of the derivative follicles. The phenomenon of hair cycling appears to be inherent in the structure of the follicle; in other words, if a follicle forms, it will cycle—the cycling trait seems to be inherent in the follicle structure itself. In an incidental observation, it was of interest to notice that the formation and cycling of the reformed follicles occurred independent of the host follicle cycle. Since early studies indicated that the whole skin organ is affected and changes with each phase of the cycle (Chase et al, 1953; Hansen et al, 1984), it was not clear whether telogen skin could support anagen follicle growth. If telogen epidermis actually does produce an inhibitor to anagen growth, then that inhibitor may not diffuse long enough distances (Paus,et al, 1990) to reach the cells in the patch reaction (Gurdon,1989). What happens if you pre-stimulate (~6 – 12 month) your scalp SKIN with Minoxidil (2%) BEFORE your get ARI’s cell-based procedure - eh? In my personal opinion, Histogen’s very first results are A KIND of “proof of concept” of ARI’s approach with the Minox protocol. That means, if you are able to rejuvenate BOTH, skin & follicle cells, resp. 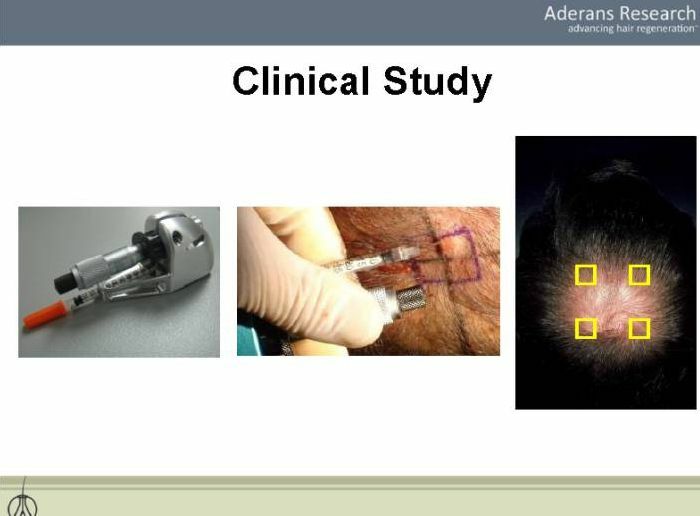 if you are able to convert/re-program every RELEVANT cell type in your scalp with help of a special protein complex, you may be able to get easier better results - besides the fact, that there is NO NEED for a small biopsy one or two month before such a cell-based procedure like Aderans’, and there would be NO NEED for a usage of Minoxidil as well AND besides the BIG fact, that such a procedure, like Histogen’s HSC, may be MUCH less expensive in general and much more “patient-convenient” too. But be assured, BOTH approaches (ARI’s & Histogen’s) will reach satisfying results in general. so we can be optimistic or not? we will have our hair back in the next 2-3 years or not? There seems to be a point in using Minoxidil “for synchronization purposes” in the neogenesis process, if this is pre-planned in advance. But I cannot understand what is the logic in switching trialists to Minoxidil once they have been on trial for several months without Minoxidil. This doesn’tseem to obey to any synchronization intent. Regarding ARI’s photos, the second one is very good, and this is a “green flag”. It says close to 80% more hair. And it is at 3-months, so there is still room for improvement.I assume this is the best case, of course. 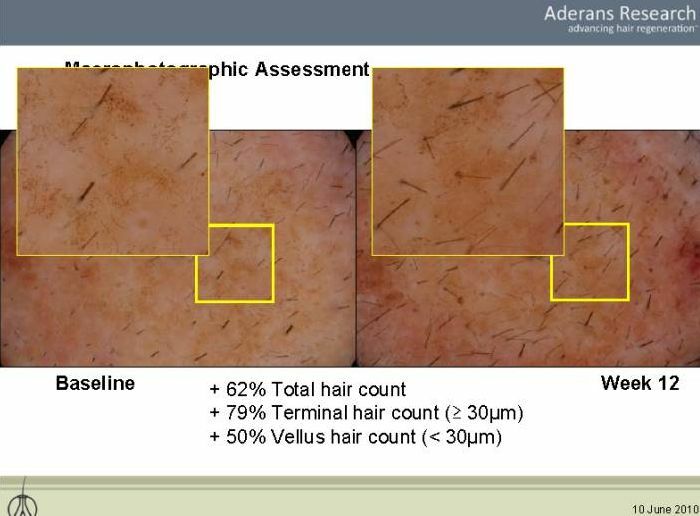 Also, Histogen’s last photo shows close to 70% improvement in haircount at 1 year. I also assume this is the best case. But I am sure Minoxidil’s best cases also get important increases in haircounts is some selected areas. So be patient until we see overall data. » » is the real state of ARI’s research. » » measure” to get results. » » Again, this is a risky theory, but very possible. » … but it’s a damn good “theory”. In fact, it’s the truth. » It’s NOT my intention to confuse anyone here, but FACT IS FACT. » Let’s assume, YOU are “Dr. Ken Washenik” – ok? » WITHOUT any skin pre-stimulation with Minoxidil! » » they mention using Minox as well. » a channel opener (e.g., minoxidil). » I don’t know why that is such a big deal to be honest. » That’s because it isn’t such a big deal. » 1990) to reach the cells in the patch reaction (Gurdon,1989). » Minoxidil (2%) BEFORE your get ARI’s cell-based procedure - eh? » “proof of concept” of ARI’s approach with the Minox protocol. » expensive in general and much more “patient-convenient” too. You dont get it Spanish Dude, dont you? Minox is used as a boosting tool to get the outcomes much faster then on a normal base. In fact that good for us and saves some time. But you guys are wrong with one point. Boosting tool to accelerate the process? is this what ARI replied to your email? please, post the reply to your email. » You dont get it Spanish Dude, dont you? » In fact that good for us and saves some time. » But you guys are wrong with one point. As everyone here said before its just to boost and save some time nothing more. If Rogaine could regrow hair, do you really think that nobody would use it? Rogaine could never regrow hair, or at best only a few which ar way lesser then the ari treatment. But hey you know better then rev, Iron Man and all the other intelligent people here, because you were always right in he past. Btw if you always know everything did you saw those terrorist attacks in madrid coming? Just wanna know out of curiosity. And can you please give me next weeks lottery number for Euro Millions and the german Lottery, would be nice. Thanks in advance, you know what you should at least develop some fact checking like Iron Man, his postings are imho “agressive but educational” but yours are always so whiney and complaining about everything but not yourself. You spent serious time on finding my “Death Threats” instead of carefully reading ARI and Histogen News. » please, post the reply to your email. » » You dont get it Spanish Dude, dont you? » » In fact that good for us and saves some time. » » But you guys are wrong with one point. Leeroy.Jenkins are you joke or what? They have been on this study 8-9 years (means long time) and now they need minox as a boosting tool? if they weren’t busy during those 8 years then why the heck they are busy now? It can be only bad thing what they are doing there atm. minox… damn jokers. Their studies wont end before the end of 2011 anyway and they should get those results by then without minox too. before i really believed that ARI gets what he wants but now i think they are pretty much failed and they are going to show us the results what minox can give you (what you can reach at home) and selling their product that “it really works”. they probably hope now that minox gives to some of their 200 participants some decent results what they can show as as a good neogenesis result. now i don’t believe in ari anymore. best bet is histogen at the moment and their photos were much better than ARI photos. even BHT (user here) didn’t get decent results and this means only bad. » lesser then the ari treatment. if minox doesn’t regrow hair then why the heck ari uses this product at all??? they probably show us their minox results by the end of 2011 and their hm technology doesn’t work. they afraid to look stupid after phase 2 if they don’t have nothing to show us. minox is their emergency exit (probably they hope so). 8 years wasted time and money. they must pray the god to get out from this hole where they are now. » madrid coming? Just wanna know out of curiosity. Terrorist attacks in Madrid ?? Can you guys please take a break from this mass-hysteria? First you complained no one wanted to take on hairloss research. Now we have ARI throwing everything at the problem (including the kitchen sink), and you guys are still complaining. When will it ever end with you guys? Phase 2 will be over soon enough… can we put-off the insanity until than? » » lesser then the ari treatment. » god to get out from this hole where they are now. then why did they say with plenty of convenience, that they use minox? obviously they dont want Minox thing to be kept as a secret, In fact, when shooter called them, the guy who answered the phone wasn’t obligated to admit that. the story is that they dont want to keep it in silence,something else is going on. » Can you guys please take a break from this mass-hysteria? » First you complained no one wanted to take on hairloss research. but i believe we don’t see any hm by ari at the beginning of 2014. their product doesn’t give you full head of hair. maybe it grows some hair in your head (for example 4 hair per cm2 like BHT got here) and this is pathetic because you still look bald. you need at least 30+ graft (around 50+ hair) per cm2 to look good but they are not able to offer this. they have lied about their timeline several times before and they probably lie at the moment too. 2014 can be in my wet dreams only. » » » lesser then the ari treatment. » » god to get out from this hole where they are now. » then why did they say with plenty of convenience, that they use minox? maybe they accidentally told this out and they can’t now cut this out from the records etc. even BHT (user here) didn’t mention this before that he asked to use minox. after spanish dude questions he decided to tell us “yes, he was asked to use minox”. in my opinion this is big bull*hit to use minox in their study. their product just doesn’t work. » minox in their study. their product just doesn’t work. But look, THIS product definitely works - without Minox! » » minox in their study. their product just doesn’t work. » But look, THIS product definitely works - without Minox! this is GHO and i wanna see several full head of hair patients treated by him to believe this. i wanna see that someone from nw6 reached to nw1. if he can do/prove this then i believe it. » » » minox in their study. their product just doesn’t work. » » But look, THIS product definitely works - without Minox! » he can do/prove this then i believe it. Can’t you see the pics here? The guys on the pics have a full head of hair again!! » » » » minox in their study. their product just doesn’t work. » » » But look, THIS product definitely works - without Minox! » » him to believe this. i wanna see that someone from nw6 reached to nw1. » » he can do/prove this then i believe it. » Can’t you see the pics here? » The guys on the pics have a full head of hair again!! those pics doesn’t prove there anything. i wanna see tens of people with full head of hair. i wanna hear this from the real patients who turned to nw1. i don’t wanna hear this from salesmen who try to offer any shi* to you. do you believe this? if yes then you don’t need any surgery to restore your full head of hair. With ARI or Histogen I would settle for seeing some moderate regrowth. A few thousand grafts’ worth of improvement would impress me. But when FUE transplantation is part of the process, then we really have to demand a ton of proof just to know where the growth really came from. I wanna see NW#6-7 to NW#1 and there should be no reason they can’t produce it.